United Veterans Mutual Housing Company, Inc., a.k.a. 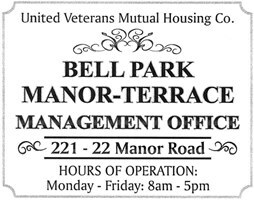 Bell Park Manor Terrace is a two story, garden apartment cooperative development built in 1951 as cooperative housing for veterans only. In August 1990 the corporation went private and residents were no longer required to be veterans. All residents (shareholders) own shares in the corporation and are strongly encouraged to be involved in the community. The Maintenance Department will be undergoing renovations which will begin on MONDAY, MARCH 25, 2019. The rip up and repaving of the driveway will be started a few weeks later. The Maintenance Department will be temporarily relocated, starting on Monday, March 25th, to Building #47 (south side of Hillside Ave.), in the back of the building, in the basement, under 227-02 Hillside Ave. The phone number, 718-465-7550, will remain the same and will be working at all times during the temporary relocation. If you have a maintenance issue during this time frame, we strongly encourage you to either call or walk to the location, as parking in this area is extremely limited. You will be notified in advance when the driveway and garbage room will be closed. Residents who either have a garage or parking space in that driveway will receive a separate notice as to when you will not have access to your garage or parking space. We expect this entire project to take approximately 5 - 6 months. Enter your email address below to receive the latest news and information from Bell Park! For access to exclusive tenant information, including forms, policy information, resident news, and more, please log in below.